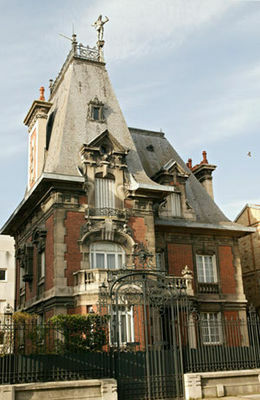 This villa was built between 1907 and 1908 based on the plans by the architect Bourniquel (Paris). The fore-part is decorated with superimposed openings, with a balcony on the first floor and symmetrical apertures in the left wing. To the south, there is a garage and a veranda. The decor is typically Art nouveau style: the truncated pyramid-shaped roof in the fore-part acts as a platform bordered by ironwork; the statue of a herald originally held a flagstaff that served as a wind vane. Gargoyles and rainwater drain pipes are finely worked. Stone was used to decorate the corner reinforcements, with brick nogging and slate roofing. Highly visible from the boulevard, the villa was a showcase for pharmacist Pozzi’s wealth, whose initials are inscribed on the gate, in the steps of the entrance and on the chimneys. But the owner did not live there. In the 1930s, it was rented to Albert Prince, an advisor to the Troyes public prosecutor and victim of the Stavisky affair.